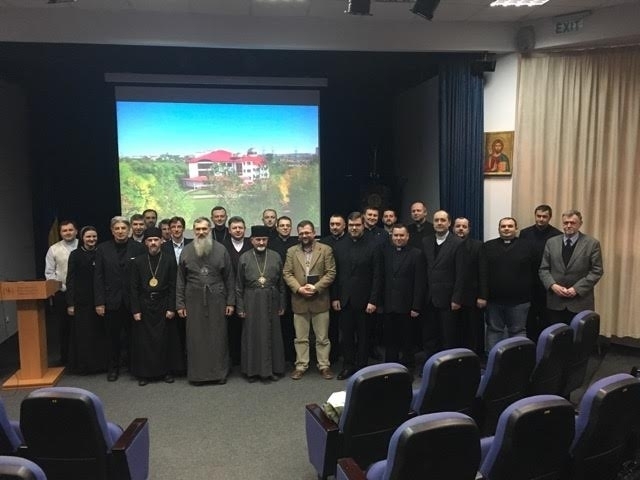 March 13, Canonical Depart of Patriarchal Curia of UGCC within the framework of annual meetings of church lawyers in cooperation with Ukrainian Canonists Association Patriarchal Liturgical Commission of UGCC held regular scientific conference “Liturgy and law with their aspects of agreements and disagreements in UGCC”. The event was held in Ukrainian Catholic University in Lviv, blessed by Archbishop and Metropolitan Evhen Popovych, head of Canonical Depart of Patriarchal Curia of UGCC. Topic of the conference was selected not randomly as the nearest Synod of Bishops of UGCC will be devoted to the research and discussion of proper liturgical issues, peculiar to one of the biggest East Catholic Churches. Peculiarity of such an event became participation of UGCC Episcopate with Ihor Vozniak, Archbishop and Metropolitan of Lviv, bishop Venedykt Aleksiychuk, bishop-auxiliary of Lviv Archeparchy and head of Patriarchal Liturgical Commission of UGCC, bishop Teodor Martyniuk, bishop-auxiliary of Ternopil-Zboriv Archeparchy of UGCC and bishop Volodymyr Grutza, bishop-auxiliary of Lviv Archeparchy. The conference started with a prayer and greeting word of Metropolitan Ihor, who after giving each speaker and participant the blessing, wished this event to be helpful in order to think about the tasks of two elements of tradition (Liturgy and law) in the development of UGCC locality. Bishop Venedykt, head of Patriarchal Liturgical Commission appealed to the participants with an introductory word, pointing out a necessity of holding such meetings, since they help not only to overcome existing, usually negative stereotypes among scientists, but also to realize some ideas. A project “DyvenSvit” realized by Patriarchal Liturgical and Youth Commissions might be an example of such a cooperation. The problem of four Tessaracostes in Liturgical tradition of Churches of Byzantine rite (report by fr Vasyl Rudeyko, PhD, teacher of Liturgical studies in UCU); Liturgical canons of Particular Law of UGCC - liturgical aspect (reported by Petro Sabat, PhD, teacher of Liturgical studies in UCU); liturgical canons of Particular Law of UGCC - canonical aspect (reported by fr Ihor Haley, teacher of UCU). After reports were delivered, there was a time for discussions during what the participants were able to put questions to the reporters. It was also decided that a produced scientific material will be published in the next issue of “IUS” periodical of Canonical Law. At the end a moderator of the conference fr Andryi Tanasiychuk expressed his gratitude to the participants, hosts, reporters for their scientific diligence and active participation of the participants of the conference.